Oh my gosh the Whirligig Vest is done and drying!!!! Snowy day, comfortable couch, fireplace going and the finishing just went well. I'm not totally happy with the buttonholes but they will do. The buttons mother in law gave me are dark brown, almost black and will be sewn on like a diamond instead of square. This will mimic the diamond shapes in the sweater. Hopefully the cats won't find the drying sweater and play "rug-a-cat" and hide under it. The most amazing plus of all is that the vest fits comfortably. Miracles do occur. 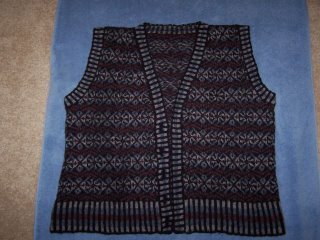 Things I learned making this vest:Steeking is not that heart pounding the second time. Third might be even easier?I like Fair Isle and the instant gratification of seeing a color pattern emerge. I will make another. Spit splicing - why didn't I know this years ago? What a cool trick. Two color two handed knitting is so much easier on the poor right hand that has already had carpal tunnel surgery. Patience while picking up the edge of the steek for the armhole and button band ribbing - had to use a small dp needle to help pick them up. I must make a chart for the decreases when they are occuring at both neckline and armhole - and check off the chart as done. 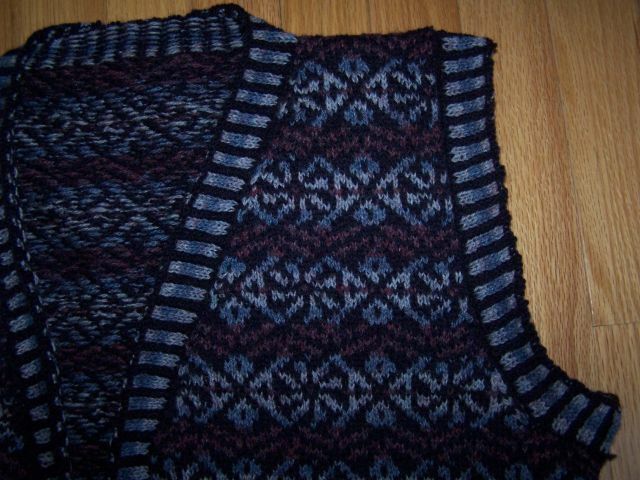 Things I did't like about making this vest:The colors I chose are too dark and muddy. 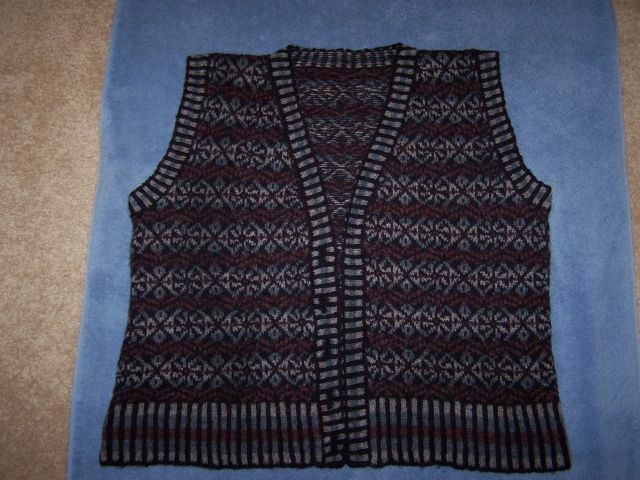 It's a bit brighter than the photos look but still not a vibrant vest. Corrugated ribbing bind off leaves little dots of the lighter color in the cast off edge. Solved this by knitting a single row of the dark before binding off. Buttonholes - need practice on this technique. Thanks Rebekka for hosting this KAL. I'd always wanted to try Fair Isle and am already to start another!